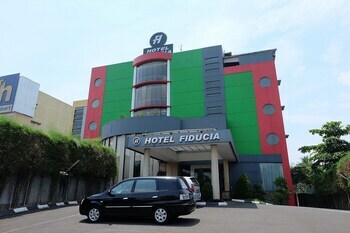 When you stay at Hotel Fiducia Serpong in Serpong, you'll be within a 10-minute drive of TerasKota and Eka Hospital. Featured amenities include dry cleaning/laundry services, a 24-hour front desk, and luggage storage. Free self parking is available onsite. With a stay at Airy Gubeng Kalibokor in Surabaya (Gubeng), you'll be within a 15-minute drive of Submarine Monument and Surabaya Plaza Shopping Mall. With a stay at Istana Petani Hotel in Sukapura, you'll be 6.1 mi (9.8 km) from Putus Square and 9.7 mi (15.6 km) from Mount Bromo. Featured amenities include a 24-hour front desk and luggage storage.